Is it ever possible to have teachers be … well … educated? At least on the issues that affect their lives? I must admit that I’m losing hope. Not only do teachers just plain ignore the facts when it comes to education, but they allow a political driving force to represent them and affect their classrooms. The teacher’s unions have one job, and one job only … make more money! How do they do that? They charge union dues. Then they charge more in dues in order to make more money. To do that, they fight to raise the teacher’s salary so they can charge them more. The teachers want more money in spite of spending more on dues, and they get behind the union. After all, who doesn’t want more money? The teachers and unions are just the same as any other greedy corporation. The difference is that corporations are private entities who are not beholden to the community trust, teachers are. All this marching, chanting, lying to employers, getting fake doctor’s notes, and causing harm to your child’s education has nothing to do with a wish to better education at all. It’s about money, plain and simple. Don’t take my word for it, take the word of a national education labor leader (second segment). When you have teachers more concerned with using your kids as propaganda pieces instead of teaching them in the classroom, your child’s education is fighting an uphill battle. Unless, of course, you go the private school route where teachers are paid much less, but get much better results. Still, I have teachers tell me that if only we paid them more, they’d care more. They are already paid more than the average citizen as it is, and that isn’t good enough. If they’d care more if they were paid more, how does that explain the best funded school districts having such a high failure rate? If more money is the answer then why have we seen no return on our investment? 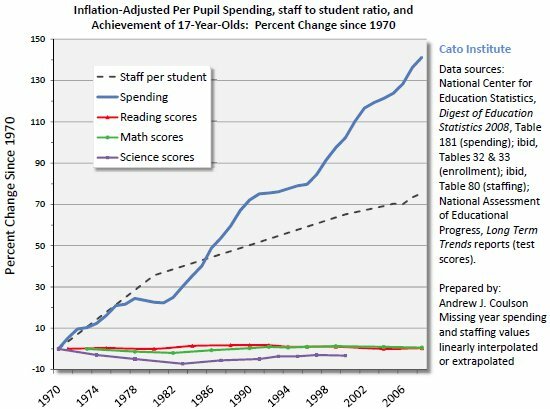 Since the 70’s we’ve increased per pupil spending tremendously (even when adjusted), but have yielded no results. This outcome is universally acknowledged. CATO just has pretty graphs. Class room size also is a non-issue. Why do other countries with much larger classrooms dish out better educated kids? Studies have also shown that reducing class size increases the number of teachers needed, which forces schools to settle on inferior teachers to fill needed slots. It’s simple quantity over quality. It’s time for teachers to realize the real problems with education. Education has become less about the kid’s education, and more about money, politics, and power. The Department of Education is simply a massive failure. 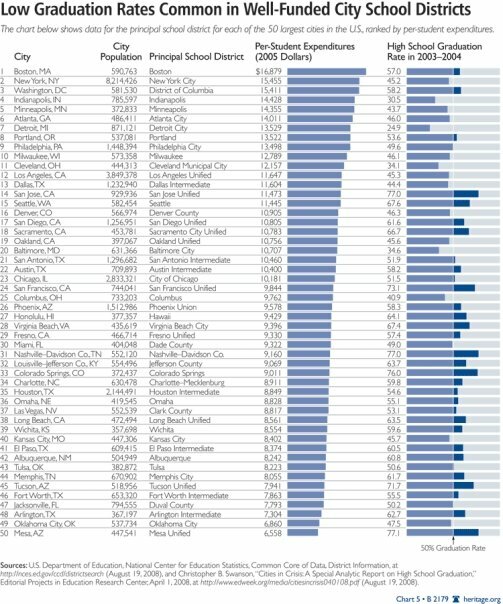 School districts around the country are top-heavy. This causes less money per pupil to get into the classroom, in spite of much more funding per pupil. Why does someone with a Masters in math have to get a teaching degree before they can teach math? That could be the dumbest thing I’ve ever heard. Teachers have their hands tied in dealing with disruptive students. It’s not the size of the classroom, it’s the inability to control the classroom. There are too many teachers … period. This has reduced the quality of educator in the classroom, and allowed schools to be filled with teachers who don’t really care about kids. All they care about is their above national average salary (after a few years), tenure, and perpetual job security even if they are a terrible teacher. There is a family element to this as well, but great teaching can overcome it. Just as a great family situation can overcome terrible teaching. Once teachers can put forth the effort to inform themselves (come on, be a role model for your students), then the problem will start to get resolved. Truly an abysmal display of abuse of authority over a captive audience by these thugs. How very sad. This is the original post from the blogger (a law professor) who filmed it. Video: Are Public School Teachers Overpaid? It’s really just a rundown comparing public vs private educators with some union thuggery footage added in. That’s something I addressed on my podcast (second segment) last month. Comments Off on Video: Are Public School Teachers Overpaid?